Summer bedding plants for containers and longer lasting arrangements, the easiest and most successful. Fuchsias, marvelous bell-like flowers in a huge range of colours and growth habits. Tend to be a bit sparse around the base and stem so under plant with something bushier. Better with some shade, they can be easily propagated from cutting is you have somewhere to over-winter them. Geraniums (properly known as Pelargoniums), these just keep going all summer long and are heat and drought resilient, get the F1 varieties, more expensive, but worth it. Ivy leafed geraniums are trailers and great in hanging containers or trailing over the edge of large urns, chimney pots or the like, they can be easily propagated from cutting is you have somewhere to over-winter them. Impatiens, Busy Lizzies. The Labrador puppy of summer bedding plants, always bright enthusiastic and eager to please, but without the mess and they don't rip up your favourite cushions. Not so good in full sun but will tolerate pretty much all conditions down to full shade with no direct sun at all, though perform better in brighter shade. 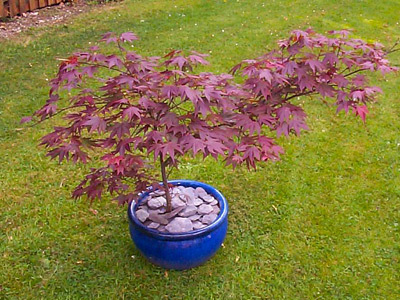 Plant a container with a single colour for best effect. Good for under planting taller plants such as shrubs or trees in containers, we always have at least one hanging basket every summer that hangs from the branches of our old apple tree and is always one of the most successful containers we have. Petunias, One of my favourites and another star performer. They come in upright or trailing varieties, decide on which you want according to their use. I prefer the trailers placed in a hanging basket or tall container. Better when planted in a single colour for a much more sophisticated effect. Pansies, another old favourite that keep on going in virtually any conditions available in almost any colour and good on their own or as temporary under planting for other annuals or shrubs / trees in containers. Strictly speaking, they're perennials, but never very good the second year so best treated as an annual. There is only one summer bulb worth bothering with as far as I'm concerned and they are Lilies, I recommend that you have many varieties in great quantity. They're not that long lasting (though they do better than many spring flowering bulbs), but are simply so elegantly beautiful. Remove the flowers once the petals have fallen and leave the leaves to build the bulb up for next year. Depending on the variety and the size of the bulb, you'll get multiple flowers per stem. The older and larger the bulb, the more you'll get. These tend to be elegant and sophisticated rather than colourful. While any plant can be grown in a container (that's usually the way you buy them in the first place after all) not that many do very well in the longer term. Inconsistent watering, (you're bound to forget sometimes like in winter when it's dry and windy for a while and you're indoors most of the time) speed of growth, and susceptibility to frost, (as the pot is out of the ground it freezes solidly) can all take their toll. Make sure you keep an eye on the plant and re-pot it when appropriate. I don't let plants stay in the same container for more than 4-5 years, even if it's not pot-bound, taking it out, loosening the roots and changing some of the compost that falls off can give many container grown plants a boost. Think about matching the container to the plant, color and shape. Also useful is a mulch of some kind, here "violet" slate has been used, this conserves moisture, stops weeds and in my case prevents blackbirds digging in the soil for grubs and grey squirrels from checking if they left any nuts in the pot. No it doesn't normally live in the middle of the lawn, it's just there for the photograph. Conifers, a great variety are available, make sure you choose one that is slow growing so that it doesn't outgrow the pot too soon. Watch the watering though, conifers do a trick where they can die but don't go brown for ages. By the time it does start to go brown it's far too late to do anything about it. Buxus sempervivens, Box. The evergreen shrub for containers (as well as bay), understated and graceful. Easily coaxed into a variety of shapes for the topiary fan, traditional ball or pyramid shapes are the ones you're least likely to get fed up with in time. Fully hardy. Laurus nobilis, Bay. The evergreen shrub for containers (as well as box). Shiny aromatic dark green leaves that can be used in cooking. Not as hardy as Buxus, needs a more sheltered position preferably in sunshine. Lavenders. Herbs in general lend themselves well to container gardening as they do well when they get a lot of sun and many types are tolerant to drought. Many of them however get straggly quickly are are not so good in the longer term. Lavender is the exception to this rule and will perform well looking all Gallic and self contained while being aromatic and producing many gorgeous flowers. Make sure you get a dwarf variety such as Munstead. Rhododendrons (these are acid lovers so make sure you buy ericaceous compost). Wonderful large colourful flowers in late spring with handsome glossy evergreen leaves. If your Rhododendron isn't so large to begin with, bear in mind that it will get large, so you'll need to repot it into bigger containers, planting it in the soil is not really an option in much of the country as the soil isn't acid enough. Roses Many roses are good for containers, but not all varieties will be happy. As long as you avoid the shrub roses, hybrid teas and climbers and in particular look for "patio roses" you shouldn't go far wrong. Myth - Containers are a low maintenance form of gardening. In the first place it all seems so simple, no digging in the hard earth, no incorporating messy garden compost or manure and no worms (included that one for my wife). The reality is however that despite the ease of setting them up, containers are not an easy form of gardening. Compared to being planted in the ground, the plants have very little substrate to keep them going. This means two things, first and foremost - they will NEVER receive enough water from the rain to fulfill the needs of the plants. You will ALWAYS have to water them with greater or lesser frequency to keep them alive. Like a hamster in a cage, they need regular attention. Secondly, the plants will need feeding to keep them performing well, however stuffed with plant food the compost may be it will not be sufficient. At the minimum, you will need to add some slow release fertiliser pellets or more likely you'll need to give the container a liquid fertiliser every week during the active growing season. OK got that? Lets start being positive. Putting aesthetics aside this comes down to a question of size and material. Containers work better the bigger they are, this is a universal rule, no ifs or buts, the bigger they are the more water they hold, the more compost and more food they hold and the more stable they are. You may like small containers but you'll have to work harder to keep them going, a day or so forgetting to water in mid summer will not be forgiven. For the same reasons, water proof containers - resin or glazed pot, are generally better than porous terracotta containers as they retain moisture better - however I like terra cotta and about half of the containers I have are of this material. You can around this partly by lining the terra cotta pot with plastic, I use ripped up bin-liners. Think opposites, large tall containers, urns etc. look better with low plants in them, particularly trailing plants, whether annual or perennial. Also if you try to put a tall plant in a tall container it'll probably keep getting blown over. Taller plants look better in low wide containers as well as being practically better as they're more stable. Another good thing about containers is that you can move them about to find the best place to put them. Don't think though that they only have to go on a hard surface or beside a doorway. They can be very effectively placed at the front of a shrubby border or somewhere similar. If you've some shrubs that flower spectacularly over a short time period and then just sit there being green the rest of the year, they can form the perfect backdrop for an elegant container with some summer bedding plants in them, particularly a tall container such as an urn. If fact if you want to be particularly clever about it (and have a bit of space out of the way to use as a nursery) you can grow some large plants in simple large black plastic containers to dot around the borders (but with pot hidden in this case). When your containerised plants are flowering put them in the border and when they're over put them back in the nursery to recover again. Containers are ideal for placing in corners and awkward areas with a hard surface that is never actually used. Think carefully though about placing them on you patio or deck when they don't need to be. They will almost certainly discolour the area underneath them and are taking up space that you have probably paid quite a bit of money for, probably best to move them off the patio or deck.